Leftover white denim (lightweight) works reasonably well for the face, the sweatshirt fleece works well enough for the ears, but the black fleece for the hair loses little fuzzy bits constantly so I have to work hard to keep his face looking clean. 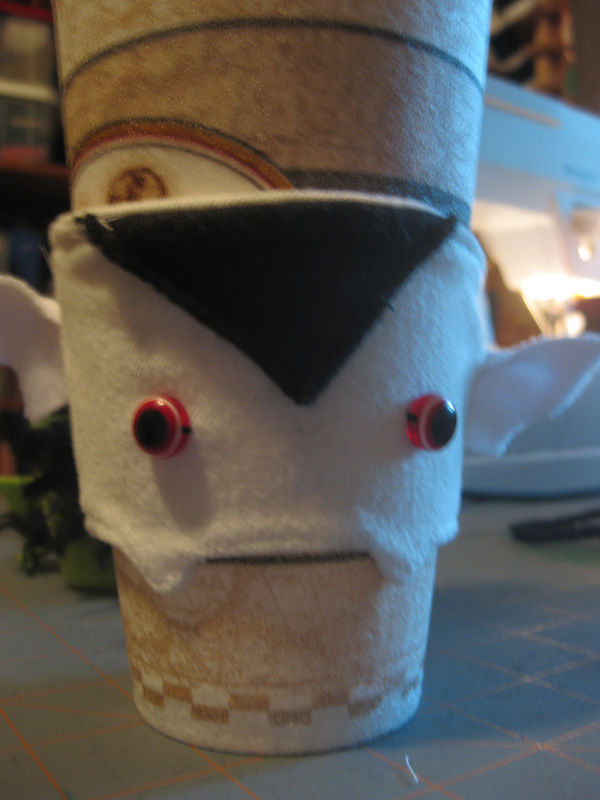 Also, his fangs sort of disappear into the white cup. I'm not sure how to solve that problem. He also works as a rather large cuff bracelet -- I'm considering making the next version with velcro or something that would let them be made smaller to better fit a wrist -- not sewn in a pre-made circle, but easily circled later. 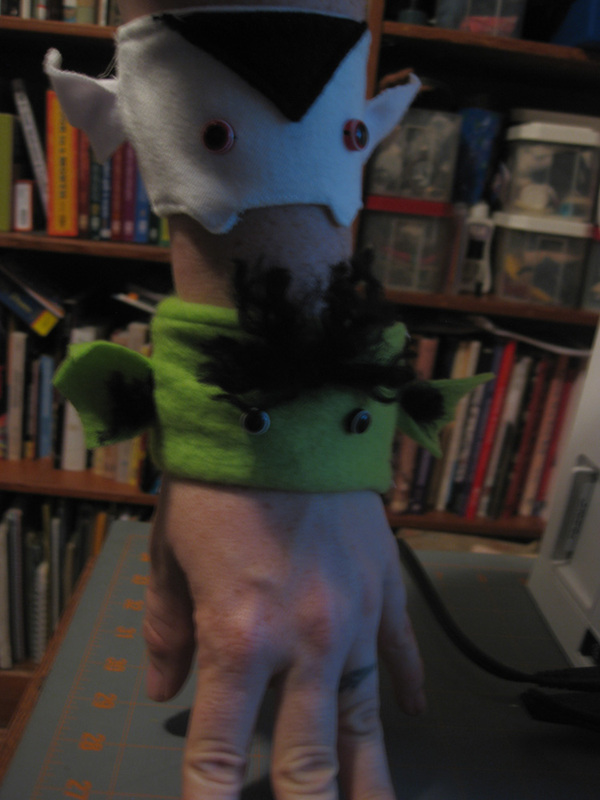 Goblinimus, the sleeve, was made of a green fleece. That doesn't work at all. It is too fluffy and I can't get the finished version to even slide onto the cup. 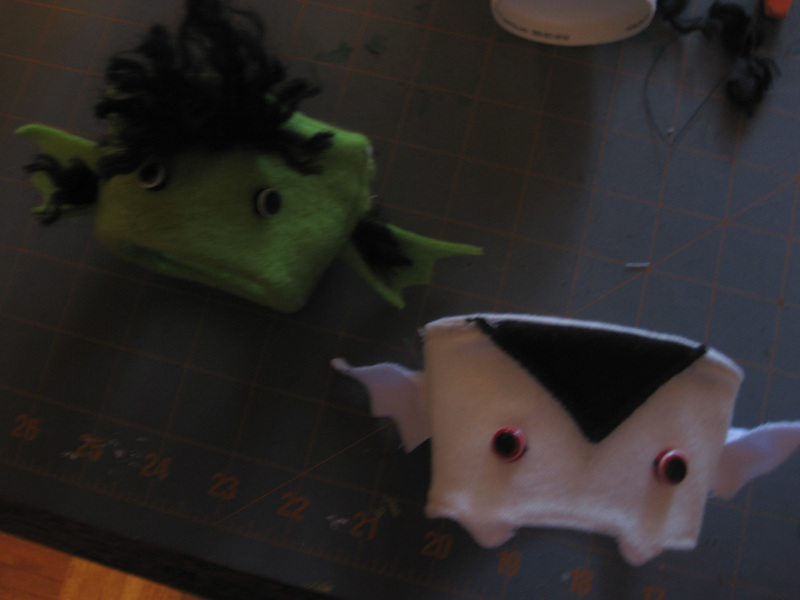 (Fluff adds volume so, even though I made both our of the same size cutouts, Goblinimus went together noticeably smaller.) He teaches me that I need a smoother fabric. NEED, not prefer. Or I need to add a full inch to the pattern width -- and people who don't go to smooth-cup Starbucks (choosing instead the lumpy styrofoam or foam coated paper, like my sample cup) will probably still have to work it on. Maybe velcro really is the way to go. Also, I don't like the smooth bottom edge for Goblinimus. Next version, I'm going to make it jagged all the way around. Like ^^^^^^^^^^^. I think I can also do a Frankensleeve, and Cthulhu, but I need to wait until I get a green that is not fleece. Have I discovered my next binge activity? 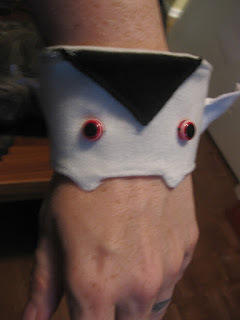 You should totally make them cuffs on one of your shirts.